Remember that one time I wrote about how great Gwyneth Paltrow is? Well she has inspired me again. The latest Goop newsletter to grace my inbox was about cooking with “superfoods.” In the newsletter GP writes that as the new year begins she is neither detoxing nor dieting, but rather trying to better incorporate these foods into her diet. And I’m right there with her. So when confronted with a nearly bare fridge at lunchtime yesterday, I decided to supplement leftovers with some superfoods (spinach and walnuts), and voilá! a delicious, filling and superfood-fortified lunch. Read on. Part 1. The leftovers. 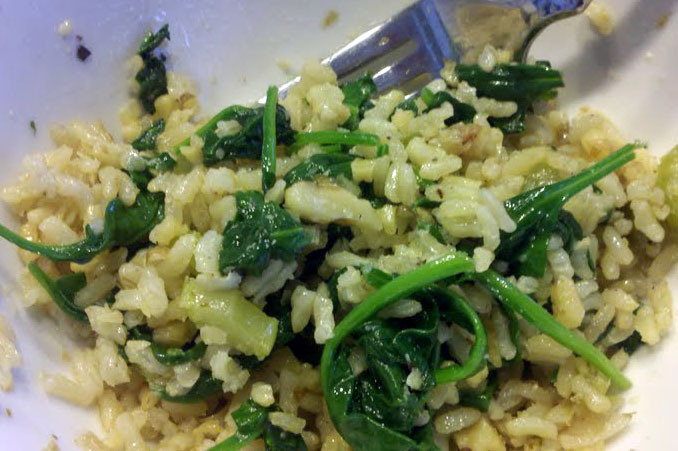 Momma’s rice pilaf consisted of brown rice, sauteed onion, celery and green pepper. Part 2. Julianne makes lunch. In sauteé pan, toss the handfuls of spinach and the other clove of minced garlic in with some olive oil. Wilt spinach. (This happens incredibly fast.) Then, toss approximately one bowlful of the “leftover” pilaf into the pan to mix it all together, and in theory warm up the leftover rice. Once you dish it up, sprinkle your chopped walnuts on top and add a little grated parmesan. I also season mine with sea salt, fresh cracked black pepper and a touch of garlic salt for some extra garlic flavor, although you could season with any number of delicious spices. Added bonus of eating this — chewing all the walnuts and cooked spinach takes time, so you eat slower, which is something I always need to remember to do anyway. Here’s to starting the new year off right!